Will We See A Cryptocurrency Wipeout This 2018? Every cryptocurrency investor and trader must carefully consider the underlying facts to their investment. There are major red flags from a fundamental and technical point of view. Therefore crypto traders and investors should invest only as much as they are ready to loose in case of a total wipeout. Moreover, everyone should critically question expert opinions suggesting to buy cryptocurrencies. Right now we see a great opportunity to divest at attractive levels. It is highly likely that the situation will change. A total wipeout is not unlikely in the near future. Cryptocurrencies are in a classic bubble with all ingredients it takes right now. There is almost no fundamental value in cryptocurrencies. There are no dividends, interest, or anything similar benefits for bitcoin holders. The only fundamental benefit is to simplify payment processes for illegal activities. Cryptocurrencies have an excessively unstable value. They are not suited at all as a mean of payment. Currency is an awfully displaced name for these instruments. We are dealing here with the purest form of speculation that the broad public encounters most likely just once in their lifetime. Wikipedia has counted something around 1,400 altcoins around year end 2017. The mechanics of many of these instruments are exactly the same that are found in already well-known penny stock scams: The issuer is the only person long (he/she can sell) the instrument and satisfies demand from buyers. It is quite obvious that a short squeeze must occur. The bucket will be pulled further and further away from the buyer resulting in price gains. Moreover, prominent supporters are hired to „consult“ these ICO’s in return for coins. These alleged experts use their public standing to animate the broad public to invest in their supported projects. They provide short stories on how great their promoted product is. There are extraordinary similarities to a Ponzi system. It breaks down quickly as confidence erodes. It is therefore crucial to question the statements of these experts: Why is the ICO great? What’s its use in the next two years? Is it going to create positive changes for enough people in society? What are the underlying facts to the claims? 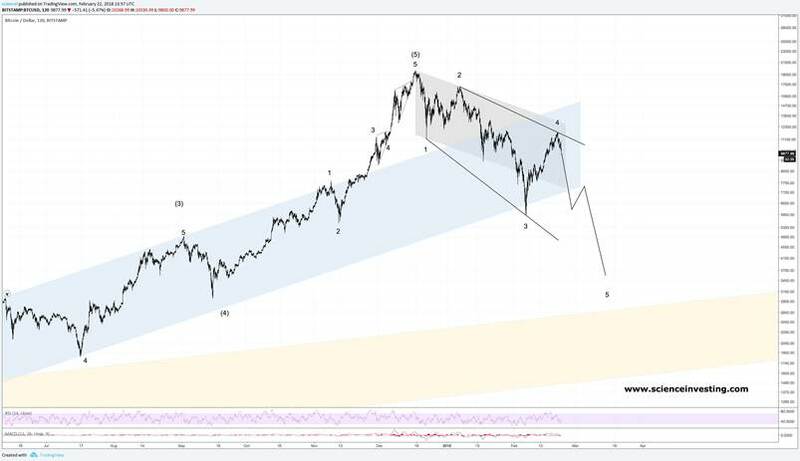 The short term Bitcoin Elliott wave structure counts best as a 3-wave correction. It roots at the Dec. 17th high and corrects to the downside. This pattern here implies on a standalone basis a high odds case for followthrough to the upside to another all-time high. However, a bird’s eye view over the entire crypto-space tells a very different story. Further upside seems for most of the major altcoins unlikely. The technical picture given on our website on our January 2018 update is on the way of getting confirmation. Moreover, the Bitcoin’s rebound off the February 2018 low counts as a 3-wave move to the upside as we publish this. We therefore assign the highest odds to a leading diagonal pattern for the Bitcoin. The target is below $4,000 for this structure. Our case here is severely weakened if 11,750 gets crossed to the upside. This price action makes a new higher high most likely. 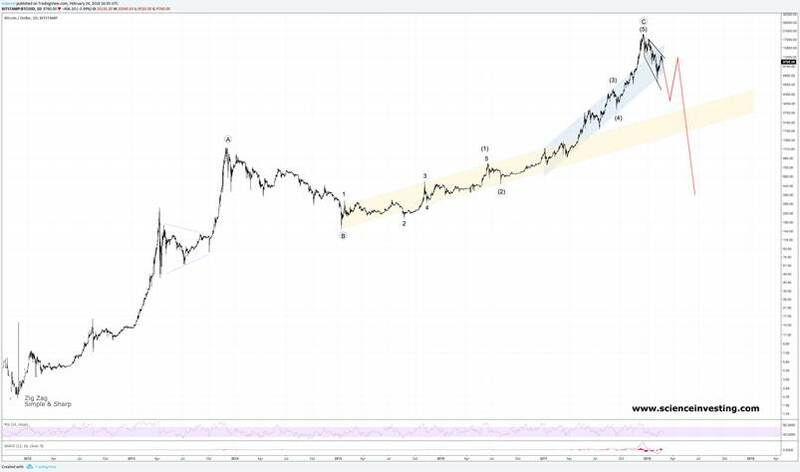 The Bitcoin’s long term Elliott wave count shows a terminal A-B-C structure into December 2017. Historically the bursting of a bubbles occurred swiftly. There is no clear evidence why this should be different for the Bitcoin. Technically, the initial leg down seems to develop as an expanding leading diagonal. The pattern will be most likely complete in about three months time. A subsequent correction should lift price levels probably into April/May 2018. We expect a third wave to start around late spring or early summer. It will most likely erase the vast majority of price gains, which accrued during the past years.